When sea turtles are released on Jekyll Island, it’s a jump-for-joy day on Jekyll Island. And when Cap’n Crunch and Archie were turned loose on June 6, a crowd of several hundred celebrants cheered and snapped photos as the recuperated turtles flipped sand on the way back home and into the surf. 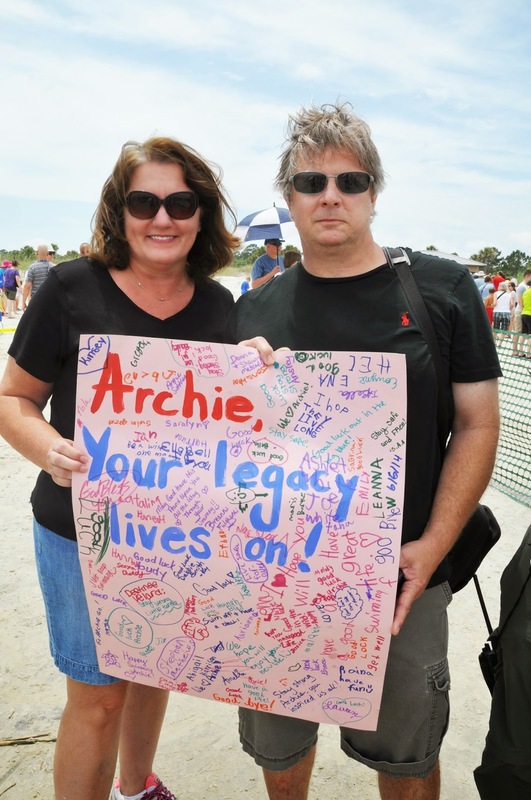 a pediatric surgeon in Savannah, and his wife, Jane, hold a poster signed by Archie’s fans. Archie is one lucky dude. There he was—head down and tail up—about to drown in Bryan County’s salty Kilkenny Creek, near Richmond Hill. Much longer like that and Archie would have been one dead juvenile green sea turtle. Lauren Miller, Lyssa Puttis and Maranda Miller. 50 to 100 patients each year. alert and caring Dr. William Boswell and his wife, Jane. When Dr. Boswell isn’t performing pediatric surgery at Savannah’s Memorial Medical Center, he and Jane enjoy time at their river house near Kilkenny Marina. Last month, while boating, they spotted Archie, bobbing up and down. They knew he was in trouble. Wanting to do the right thing, they called Georgia’s Department of Natural Resources. The ranger said to rescue the turtle. So with Jane guiding the boat, her husband fished 35-pound Archie from the creek. Before long, a DNR ranger arrived, and Archie rode shotgun in a pickup on a quick trip to Jekyll Island. The Boswells were effusive in their praise of DNR’s personnel. Archie is one lucky dude, because he was spotted and saved. And then he was lucky that Dr. Terry Norton and his staff at the Georgia Sea Turtle Center (GSTC) knew exactly what to do. It’s doubtful that Archie had been munching on refried beans and a burrito, but he had too much gas in his gastro-intestinal tract. X-rays showed that Archie didn’t have a blockage. With the aid of the right medication—brrrrrrwhomp—and Archie was diving and surfacing, feeling less bloated and brand-new. That was on May 10th. On June 6, I met up with Archie, his rescuers, his wildlife veterinarian, center staffers and a cheering throng of several hundred folks. The lucky dude flipped his way down Great Dunes Beach and into the Atlantic surf. (Actually, Archie could be a girl, but no one knows.) Turtle-release is a jump-for-joy day on Jekyll, and I was there—with two grandsons—to join the jubilation. Archie’s new-found and rejuvenated buddy was set free, too. Cap’n Crunch, a young loggerhead sea turtle, was rescued last December, after getting too cold and being stranded on Massachusetts’ Bay View Beach. The captain was taken first to the New England Aquarium, but later transferred to Jekyll with two other loggerheads. While there, the staff noticed that Crunch had a bone infection. Again, GSTC went into action on him/her. Actually, more than the turtles are lucky, thanks to a vision Dr. Terry Norton had in the early part of this century. As a wildlife vet on St. Catherine Island, treating exotic animals like zebras and antelopes, plus a large variety of birds, he saw the need for a special place for injured sea turtles. By 2007, GSTC was open. Before long, he became its director, supervising a staff of 35—paid and volunteer. The center, in the historic Millionaire’s Village, relies heavily on donations. A few years ago, I adopted a sea turtle so that a grandson could follow it—via satellite—after the loggerhead swam back into the wild. get a good look at Archie before he returned into the wild, along the Atlantic coast. You should visit the center. But before you go, click on Georgia Sea Turtle Center.org [or find them on Facebook]. You’ll see why Archie, Cap’n Crunch and company are lucky dudes or dudettes, because they wound up on Jekyll Island. And you’ll feel better for helping, too. But if you eat too many refried beans and burritos, well, you are on your own.